Feel free to read the changelog in the dedicated "WinReducer EX-80" website download page ! Feel free to read the changelog in the dedicated WinReducer EX-80 website download page ! Feel free to read the changelog in the dedicated WinReducer 8.0 website download page ! "WinReducer 8.0 - v2.1.4.0" is available ! "WinReducer 8.0 - v2.1.3.0" is available ! "WinReducer 8.0 - v2.1.2.0" is available ! "WinReducer 8.0 - v2.1.1.0" is available ! "WinReducer 8.0 - v2.10" is available ! "WinReducer 8.0 - v2.02" is available ! "WinReducer 8.0 - v2.01" is available ! This is a maintenance update ! Many new things, improvements and fix have been added in this build. "WinReducer 8.0 - v2.00 (Final)" is available ! WinReducer 8.0 - v1.99 (Beta 1) has been released ! This new version supports all the good stuff from WinReducer 8.1 and 7.0 (GUI Themes, Windows Themes, Languages Packs, ...). * WinReducer 8 - v1.02 (Final) is available ! WinReducer 8 - v1.01 (Final) is available ! 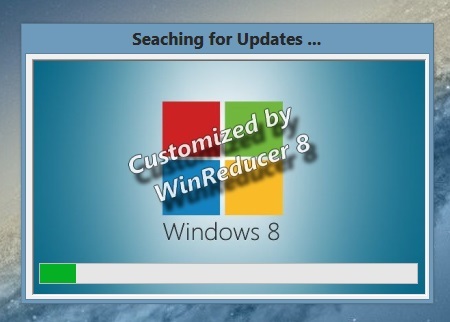 I'm really proud to announce that the Final build of WinReducer 8 has been released ! WinReducer 8 - v0.90 (beta) is available ! This is a major update with many new bugs corrected and improvements. If you use previous version, you need to update to v0.90 to avoid important troubles, especially with .Net Framework 3.5. WinReducer v0.77 broke it, if you removed "Accessories - Accessibility", so in your installed system, you can't installed .Net Framework using Dism or WinReducer ... you need to recreate your ISO with v0.90 and reinstall it on your system. And as always it's better to try in a virtualization software (like VirtualBox or VMware Player) and report bugs in the forum ! v0.90 should be the latest step before v1.00 (Final). WinReducer 8 - v0.77 (beta) is available ! WinReducer 8 - v0.76 (beta) is available ! This a maintenance build which improves the Download Updates tool. WinReducer 8 - v0.75 (beta) is available ! As usual, you could find the latest informations in the dedicated WinReducer 8 Forum thread ! WinReducer 8 - v0.55 (alpha) is available ! Official 1st time use configuration Tutorial added in the Download Page ! WinReducer 8 - v0.52 (alpha) is available ! WinReducer 8 - v0.51 (alpha) is available ! WinReducer 8 - v0.50 (alpha) is available ! ==> You will have the potential to modify/remove up to 550 different possibilities ! WinReducer 8 - v0.49.1 (alpha) is available ! WinReducer 8 - v0.49 (alpha) is available ! WinReducer 8 - v0.48 (alpha) is available ! WinReducer 8 - v0.47 (alpha) is available ! WinReducer 8 - v0.46 (alpha) is available ! WinReducer 8 - v0.45 (alpha) is available ! WinReducer 8 - v0.44 (alpha) is available ! WinReducer 8 - v0.43 (alpha) is available ! WinReducer 8 - v0.42 (alpha) is available ! WinReducer 8 - v0.41 (alpha) is available ! WinReducer 8 - v0.40 (alpha) Changelog ! First screenshot from WinReducer 8 - v0.40 (alpha) ! See you soon for more informations ! WinReducer 8 - v0.38.1 (alpha) is available ! v0.38.1 should be stable enough but may contains bugs on your system. Always try your created ISO in a virtualization software (VMware Player, VirtualBox,...) could avoid you some troubles. So be careful when using it and take all needed precautions. WinReducer 8 - v0.36 (alpha) is available ! As usual, you could find the latest informations in the dedicated WinReducer for Windows 7 and 8 Forum thread ! WinReducer 8 - v0.35 (Alpha) is available ! WinReducer 8 - v0.35 (Alpha) will be available for Christmas ! WinReducer 8 - v0.32 (Alpha) is available ! WinReducer 8 - v0.31 is available ! WinReducer 8 - v0.31 will be available next Sunday ! Many new components to remove, new useful tools ... To improve your control on Windows 8 ! WinReducer 8 - v0.30 is available ! You could find the direct download link in the download page ! All direct download links for WinReducer 7 are also available, in the same page, with all lastsessions needed to use with it. The 1st public release will come sooner ! "WinReducer 8" will be available soon ! - The forum will be available for everyone. Of course, only members could post in it. WinReducer 7 - v1.01.215 is available ! "Components to Keep" list for RT Seven Lite is available again ! Winterstorm2050's Lastsessions are also available ! WinReducer 7 - v1.00.205 is available ! I'm glad to announce that the story is beginning with the availability of the first version of "WinReducer for Windows 7".